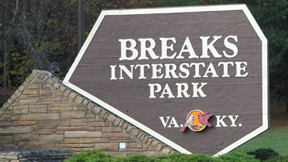 The Breaks Interstate Park is located 7 miles South of Elkhorn City, KY. The Park lies on the state borders on the eastern edge of the Cumberland Mountain Plateau. The Russell Fork of the Big Sandy river has cut a 1,600 - foot - deep gorge through Pine Mountain known as the Grand Canyon of the South. Entering the Breaks Interstate Park. Looking south from SR 80 just outside of Elkhorn City, you can see the Russell Fork River. Looking north from State Line overlook you can see Russell Fork river in the center, and SR 80 to your right. Standing in Virginia at the Clinchfield Overlook. Looking from Tower Tunnel Overlook. Russell Fork River wrapping around "Towers". East side of Pool Point Bridge looking down at the river. West side of Pool Point Bridge. The 2005 Santa Train heading to Elkhorn City ready to enter Stateline Tunnel, the day before the trip back to Kingsport.